Anita Erskine has been officially unveiled as the right hand lady to Bola Ray on Starr FM’s evening drive show Starr Drive. An official unveiling ceremony took place in the studios of the Ring Road-based station Friday, and attended by friends, and station officials. The move, station handlers say provides the biggest and juiciest pair yet on local radio. 2015 Vodafone Ghana Music Awards (VGMA) Artiste of the Year, Stonebwoy, known in real life as Livingstone Etse Satekla, is set to host a concert for his fans. According to the ‘Baafira’ hit maker, the concert is to show appreciation to his fans and also to solidify the ‘Bhimnation’ foundation. Noted for their versatility and hard work, the multi-talented music duo, R2Bees, have released another song and video titled ‘Makoma’ which literally means ‘My Heart’. The song produced by award-winning instrumentalist Kaywa and the video directed by Nana Asihene of NKACC Productions. Award winning rapper and sound engineer, EL, known in real life as Elorm Adablah, has declared himself the all-time king of rap in Ghana. Speaking in an interview on the Showbiz Today on Hitz FM with Mic Gizo, the artiste explained that it was about time people got informed about truth on who owns the title. Last night, Didier Drogba threw a fundraising party in London to help raise funds to build hospitals for Africa. The party saw attendances from celebrities from all walks of life like Fuse ODG, Christiana Milian and all the legendary footballers you can think of. Love is a beautiful thing, they say. For Ghollywood actor Chris Attoh who got married to his Nigerian sweetheart Damilola Adegbite a few weeks ago, life hasn’t been same. He is extremely excited and proud to be a husband. Chris, however confessed that his sisters all over the world were angry over his choice of a life partner. EIB Network-owned radio station, Starr 103.5 FM, is the second most listened-to radio station in the national capital, Accra, a new research document says. Information available to enewsgh.com suggests that as of February 2015, Starr FM which only started real programming on September 8, 2014, is the most preferred English-speaking radio station in the Accra catchment area. We just can’t get enough of Chris Attoh and Damilola Adegbite together and it looks like we are not alone. 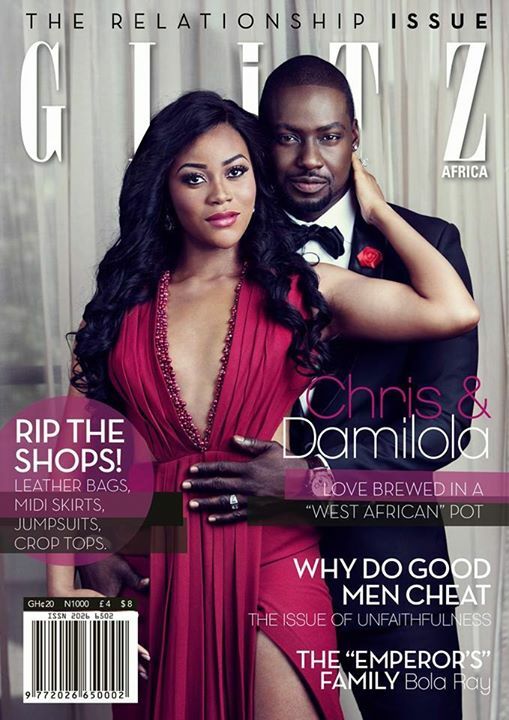 The newlyweds are on the cover of Glitz Africa magazine’s 11th issue – the relationship issue. New music from Kwaw Kese. He calls it ‘Yakubu’, and was produced by Skonti. It features Sarkodie. Outspoken Ghana actor and entrepreneur, John Dumelo, has condemned the xenophobic attacks against African nationals in South Africa. A Ghanaian, Emmanuel Kwesi Quaison was killed in the attacks in Durban, South Africa. Quaison was killed on Thursday by local gangs accusing foreigners of taking their jobs. Popular TV personality Anita Erskine has been outdoored as Co-host to Bola Ray on Ghana’s biggest afternoon drive show on radio, the Starr Drive on Starr 103.5FM. This will make the pair Ghana’s most powerful and influential duo on radio on the same platform at the same time. Menaye Donkor, wife of footballer Sulley Muntari is set to welcome her first baby. A news that should surely get her rich footballer husband excited, it comes months after speculations of divorce and a not-too-okay relationship went wild. Anita Erskine, one of Ghana’s most celebrated female broadcast personalities has joined the Accra-based Starr 103.5 FM. An official announcement will be made this evening, officials say. Many have expressed their displeasure about the duration of this year’s Vodafone Ghana Music Awards which came off at the Accra International Conference Centre last Saturday. The show which started around 10pm and ended around 3.30am has been described by some people as “boring”, citing its protraction as the reason. Two of Ghana’s most listened to radio presenters Kofi Okyere Darko (KOD) and Jeremie Van-Garshong, are headed to the re-branded Live 91.9 FM. The two broke the news Thursday on Starr Drive, hosted by Bola Ray. KOD and Van-Garshong join an already impressive lineup that include MsNaa, Sammy Forson, Jay Foley and Antoine Mensah among other young talents.